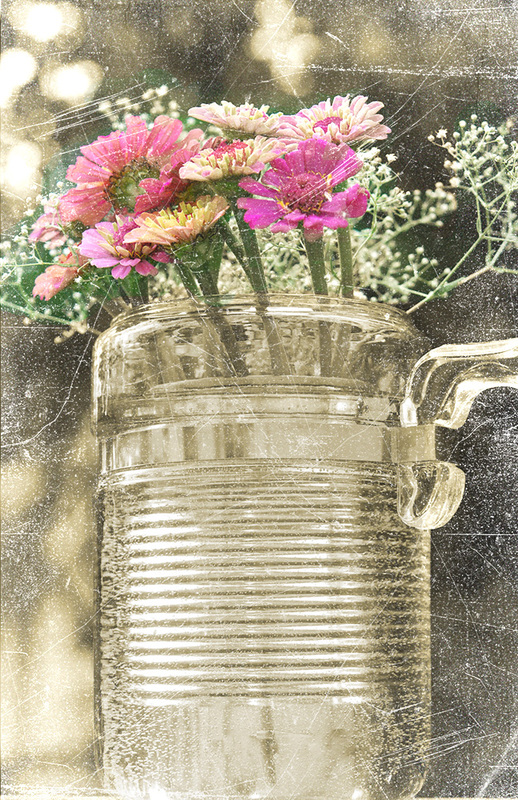 The challenge this week at Kim Klassen's Cafe for Texture Tuesday was to use her new free texture "Aurora". Last week the girls were out playing and pulled this table that I bought from my Uncle's Estate off of the porch and filled it with treasures. Then, it started to rain and I thought it looked neat so stepped out to take some pictures when the rain let up. On both of the photos I used "Aurora" on the lighter color blend mode then brushed away some of it. I also clipped a levels adjustment to the texture layer to darken it a bit more. Rain sound really good right now...boy, it's hot here! For Tea today, I'm taking liberties once again. :) No tea, just a lovely old Pyrex coffee pot that was in the "no bid" pile of the last auction I mentioned. I added a tin can in the center to hold the flowers a bit tighter. It looked really neat until it started to rust and the water turned orange, not so neat. Oh well. I used Kim's Magic textures on this photo with other various adjustments. We have a full week with our county fair and niece's wedding coming up. My husband's foot is healing but he's still out of the hog barns, dirt, and water. You can visit the other Tea drinkers here at Kim's blog and see some wonderful texture work here at the Cafe. You do the best stuff with your photos! I haven't used Aurora yet..... getting a new computer has slowed me down. ha! You inspire me continuously! Dear Jill ~ your photos are perfect for both the Kim's activities! Love your view of nature and found objects...the way the rain puddled around your girls treasures IS wonderful and sweet and it reminds me why I like the little things in life so very much...stopping to smell the flowers! Stay Cool...hoping for some rain here in VA to cool things off...but! Jill I love what you have created. The coffee pot is to die for love how the texture adds to the photo. Yes we are with you.... hot here too...my poor flowers are wilting. I guess it would be a good time to stay inside and play with photo's!! 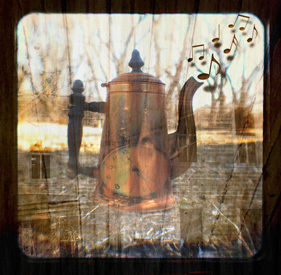 Love the coffee pot. Makes a lovely vase. I really love your photo techniques as well as your photos. That coffee pot with flowers in it is PERFECT for Tea Tuesday. I realize I'm late getting here, but I also stopped to read a few of your other posts, including the one about Kimmie's banner. I, too, love the collection of treasures your girls found. They are the best gifts a mom could receive! LOVE your photos! 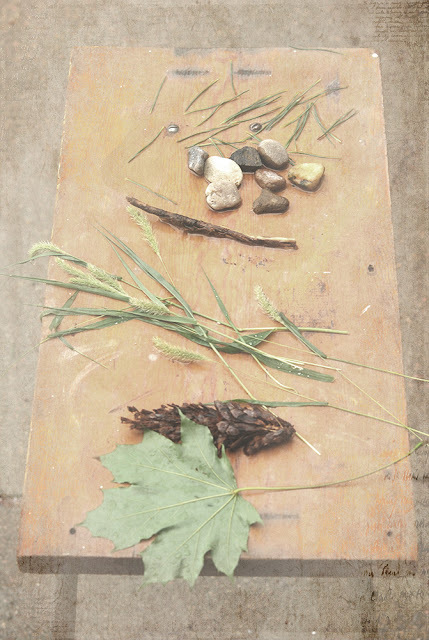 Did your girls seriously display the rocks and twigs and grass JUST like in the photo? You didn't move anything? That is some good design there! Kids do it effortlessly, don't they? You make stuff from the free box look so good! The tin can is genius! 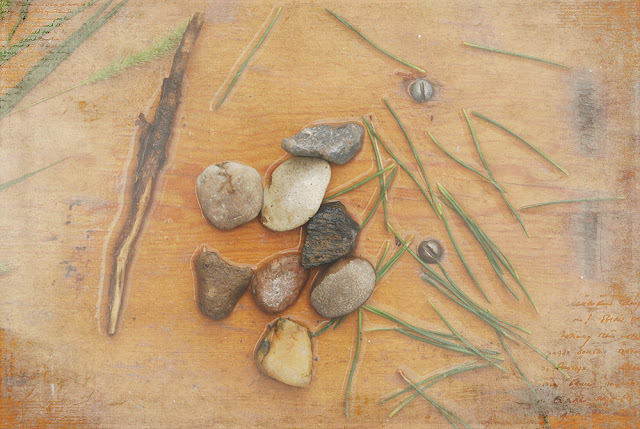 just a dreamy post ..filled with some of my all time favorites..rocks and twigs ...and tea! !